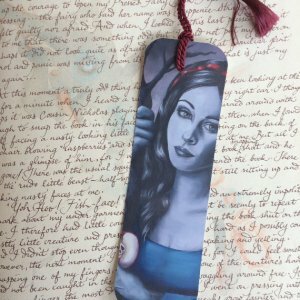 A elegant Key charm necklace holds a Gothic inspired drawing of Snow White. The Key charm is reversible. There is a lovely Celtic knot design on the back so you can wear it 2 different ways. 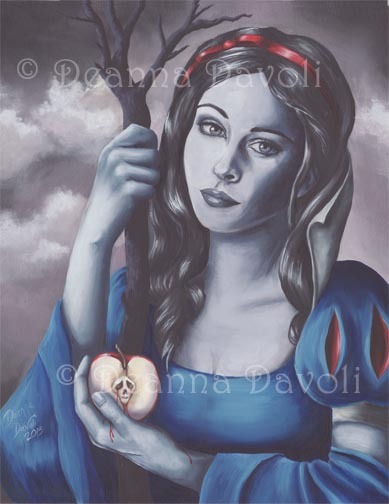 This is my gothic representation of Snow White. She caresses the poison apple from the evil witch. The apple is slowly turning her into a statue, making her cold as stone and in a deep sleep. The apple core displays a sad skull crying tears of blood. * Flanked by 2 complimenting Wonderland inspired charms (photo shows a Apple charm and a deer charm). More charms are available per request.